Coming down the pike on this space will be a comprehensive review of all of the available (in my area) canned whipped creams and I am more excited for the blind tasting/evaluation than you can imagine. The key to the very best homemade whipped cream is to use the best quality heavy whipping cream you can find. Some grocery store versions have less fat- which is no bueno for making whipped cream. If you are finding that your cream never whips- it may be your fat content to blame. I buy heavy cream from the dairy in my town (Shaw Farm)- and if you have a local dairy this is a great way to highlight a local product AND have a better chance of a successful outcome. For whatever reason, the local dairies tend to leave more of the fat in their cream (or it naturally has a higher fat content)- so this means it tastes better and behaves better for all cooking applications. Win! I personally don’t find that I need to freeze my bowl or my beaters- my cream usually whips fine in room temp bowls. I use an electric hand mixer most of the time, but I have in fact done it with a whisk- and that was sorta fun. The cream stays much softer if you do it 100% by hand, which is glorious for serving with a dark chocolate tart. 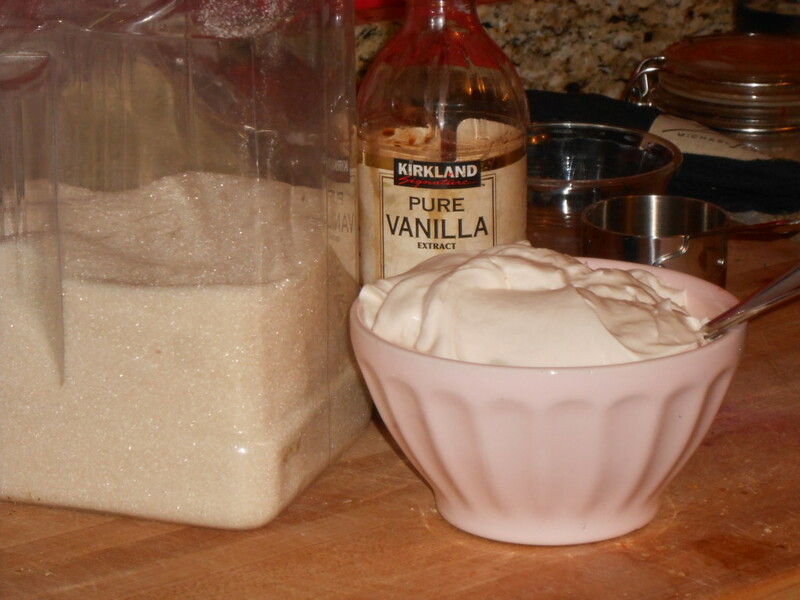 For ice cream sundaes, which is what we were making, I lightly sweetened the whipped cream. Daphne added 1 tablespoon of regular sugar to the cream prior to beating it. We also added a hefty teaspoon of vanilla. Whipped cream is best made right before serving- so your kitchen will probably look like mine- a touch messy from just serving 8 people and 3 kids dinner. No problem! Just sweep away some things to make room for one large bowl! Make sure your bowl has high-ish sides, otherwise you end up wiping whip off your walls. If your assistant needs a boost, grab a chair. 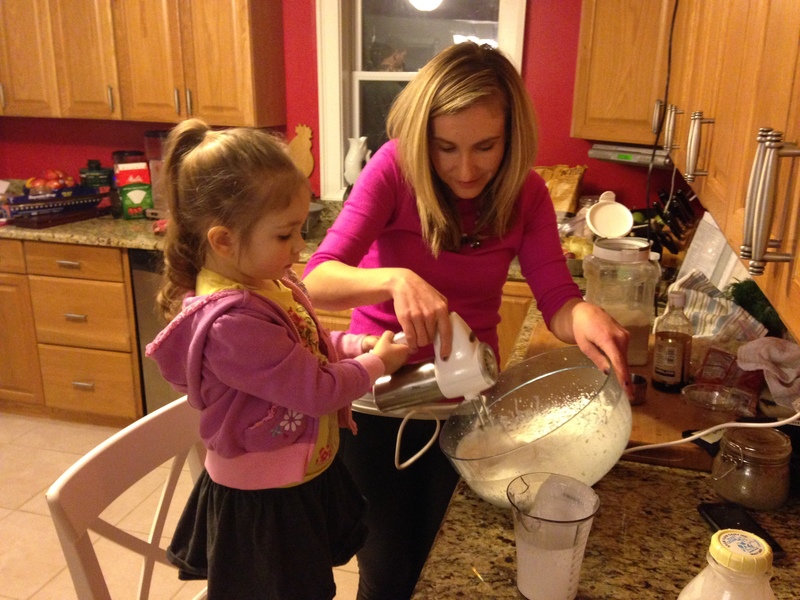 My assistant was also a little nervous about the highest speeds on the mixer- so while I usually do whip my cream on the highest setting, we settled for medium and everything worked out just fine! Begin whipping on low to dissolve the sugar, then step up the speed in increments. 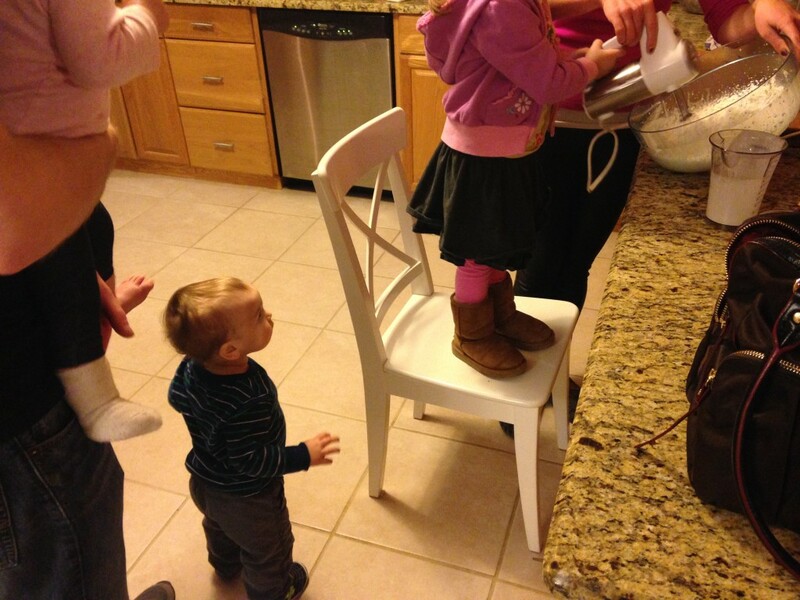 Making whipped cream is interesting and entertaining business. Samson needed to see what’s up- and you can also see Elise’s feet (on sock on, the other sock stolen by Isaac). Pretty soon all 3 will be up on stools and be put to work! Daphne declared the ‘cream’ delicious- and judging by how little was left (none, by the time I got to it)- it was certainly a success. Add all ingredients to a large bowl. Beginning on a low setting, beat cream with an electric mixer. Increase the speed until soft-firm peaks are held. Do not over beat- you will have butter (not a bad thing, but not whipped cream, either). Serve immediately. Also- Daphne and I matched and we thought that was great. The only thing I am missing is a princess hoodie- but we decided that since I was wearing a shade of purple that everything would be OK. 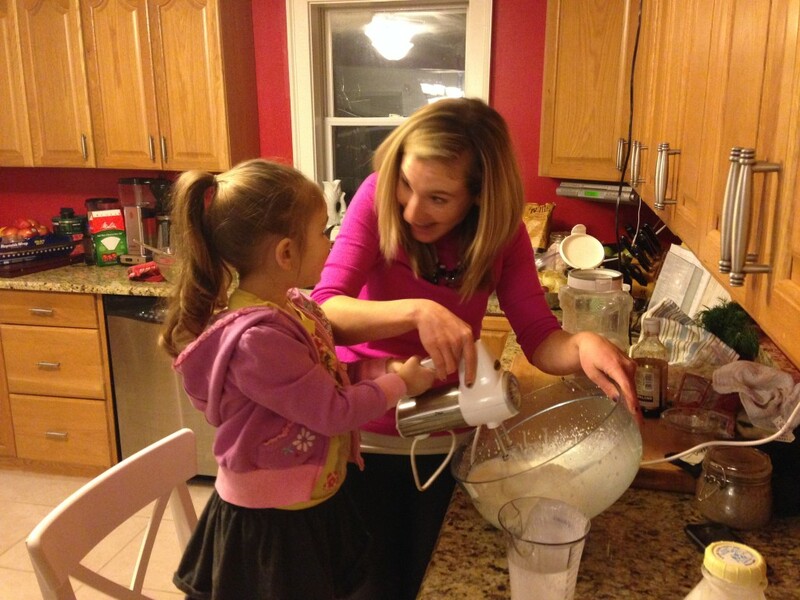 This entry was posted in Cooking, Entertaining, Recipes and tagged homemade whipped cream, shaw farm, whipped cream. Bookmark the permalink. Ahhh it is soooooo easy to make it yourself- and no chemicals! Do it! cute photos, and an excellent review of an essential skill. The heavier, high quality cream yields whipped cream that can be stored or frozen and taken out to be used later. That can’t be done with anything out of a can, of course. If you don’t have a farm right in your town, products from High Lawn Farm in Lee, MA are widely available around MA and excellent. Whole Foods and most fancier markets carry them. Thanks for the recommendation, Jeff! I haven’t tried High Lawn’s products yet, but I’m sure their cream is just as luscious. My mom and I have had terrible luck whipping some of the national brands consistently- they seem to just not contain the same mix of good things as the smaller/local brands. I have never tried using granulated sugar. Always use powdered. What is the difference in the outcome? Should I switch?? And – this is the cutest entry ever. Laughed out loud looking at the pics of these beautiful children surrounding you at the counter!!!! I used both for different reasons- granulated results in a softer cream, but if I was making a trifle, 24 hour salad, or shortcake I would use powdered because I think it creates a stiffer cream that holds up better to those applications. Powdered is also sweeter because of the increased surface area (due to smaller grain size)- so I only use it when I want something to taste super sweet. Thanks! I will definitely try granulated now.